Beauty blogs. We read them for reviews on makeup, shampoos, perfumes and all other delights that leave us looking and smelling better. But like every topic in life, we as humans don’t like to get down to the reality of an issue. Today my friends, I am going there. I am going to talk about the not so glamorous topic of deodorant. Let’s face it, we all sweat. Some worse than others, and all of us that bit worse during the summer. Human nature cannot be argued with at times, but we do have ways to fight against it. Deodorant! Without getting into too much gruesome detail, I looked for quite some time to find a deodorant suitable for me. Nivea, Dove, Adidas – none of them left me feeling with that wonderful dry feeling they promised. That was until I found Sure! I think I first came across Sure deodorant on The Makeup Fairy blog. After trying so many other brands, it was worth a try. It took a while to catch my eye on the shelves of Rossmann however as it is called Rexona here. Lucky for me I recognised the brand symbol. I use the roll on and have used all the variations of the product. the one I currently use, and use the most, can be seen in the picture above. All work equally as well. They are not sticky for a start. They smell pretty good and keep you smelling pretty good. I have had no ‘sweat patch mishaps’ with them either which is a good thing. With other deodorants, I avoided wearing tops with sleeves in the summer. Not very good for a clothing lover! Finally, they actually last. I would never go 48 hours without using deodorant, but I have went 24 with good results. This is especially good for people constantly on the go. 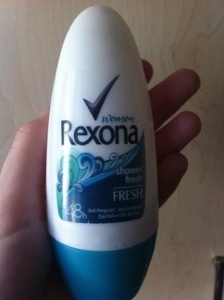 So, that is my gushing review of Sure/Rexona deodorant which has probably provided too much information for some. I also want to state that this is not a sponsored post. I am just aware that the topic of deodorant and sweating can be embarrassing for some ladies and I wanted to let you know that there is a cheap and cheerful deodorant out there that might be a good solution for you!